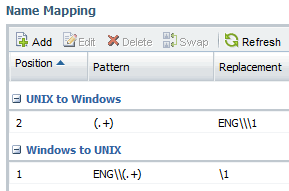 The /etc/usermap.cfg entries always have the Windows user on the left and UNIX user on the right. No explanation here for what the mappings do - for that there is the original link - I just show how they convert to Clustered ONTAP commands (at least how I think they should - please let me know if you come across any errors). PS These have not been tested in anger, just tested in the CDOT CLI and there are no syntax errors from any of the above!